History of the 54th Massachusetts Regiment: Casualty list after Fort Wagner. 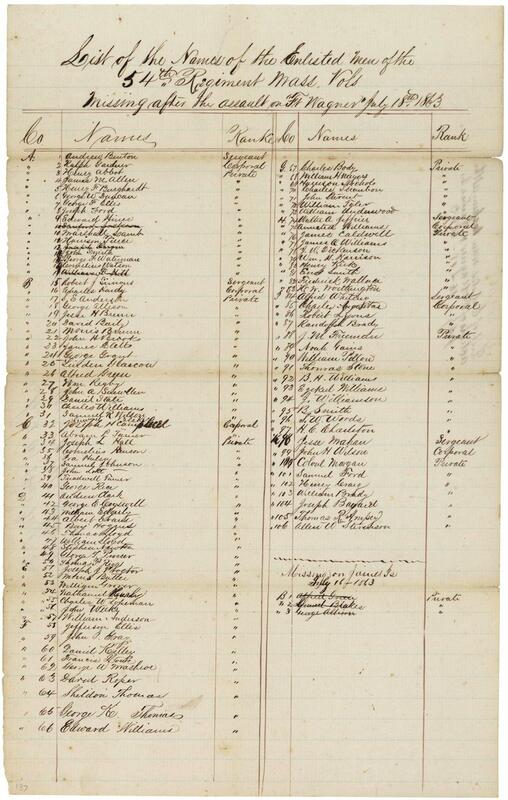 This is a list of the men missing from the 54th Massachusetts Volunteer Infantry Regiment—the first unit of black soldiers to be formed in the North during the Civil War—after their assault on Fort Wagner on July 18, 1863. This early casualty list tallied the men still missing after the assault on Wagner. Historian (and Harvard president) Drew Gilpin Faust writes that the system that collected information on casualties during the Civil War was ad hoc and inadequate. A conscientious hospital chaplain might be the one to compile and release a casualty list to newspapers soon after an engagement; a less conscientious one might neglect such a duty. In any case, the information that ended up in the papers might not be reliable, and families suffered as a result. Soldiers, Faust writes, often took the duty of informing families upon themselves, writing letters so that people could know for sure what had happened to their loved ones. In the final analysis, the 54th’s casualties numbered 281: 54 killed; 179 wounded; 48 whose bodies were never identified. The regiment became legend, memorialized in an 1897 Boston Common monument by Augustus Saint-Gaudens, a 1960 poem by Robert Lowell, and the 1989 movie Glory. You can see photographs of its soldiers and officers in the digital collections of the Massachusetts Historical Society. Click on the image below to reach a zoomable version, or visit the document’s page in the National Archives’ digital collections.